A parliamentary committee in South Africa has called on the government’s Department of Environmental Affairs to bring an end to the cruel captive lion breeding industry, which breeds lions for tourism, canned hunting, and to supply lion bones for international trade. The report by the Portfolio Committee on Environmental Affairs, which is chaired by African National Congress MP the Hon Mr Phillemon Mapulane, reflects the overwhelming sentiment expressed at the colloquium on lion breeding held by the committee in Cape Town on 21st-22nd August 2018. It also calls on the government to reconsider its decision to increase South Africa’s export quota for skeletons from captive-bred lions to 1,500 for 2018, which the Portfolio Committee considers was ‘informed by commercial considerations, as opposed to science’. Opposition to the industry was expressed by most of those who gave evidence at the colloquium, including animal protection groups, researchers, and even several hunting organisations. Born Free’s Cash before Conservation report, published earlier this year, exposed the cynical nature of the industry, and was a key factor in the Portfolio Committee’s deliberations. 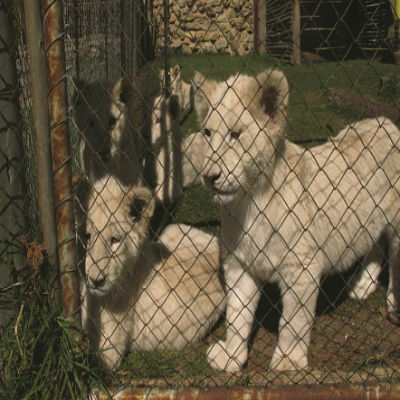 The industry is the subject of increasing international condemnation from many quarters: at its World Conservation Congress in 2016, the International Union for the Conservation of Nature passed a resolution calling on South Africa to terminate the practice of breeding lions and other predators in captivity through a ‘structured, time-bound process’. Upwards of 8,000 lions are believed to exist in more than 300 breeding farms across South Africa. There are also several hundred tigers held in captivity as well as other carnivores such as leopards, cheetahs, servals, African wild dogs, hyenas and other smaller animals. This industry cynically exploits the animals it produces for profit, tearing cubs away from their mothers at just a few days old so they can be hand-reared by unwitting volunteers and provide cute photo opportunities for naïve tourists. Many of these animals end up in canned hunts, with their skeletons eventually sold off to the highest bidder, stimulating international demand and increasing the risk to threatened populations of wild lions and other big cats from poaching.